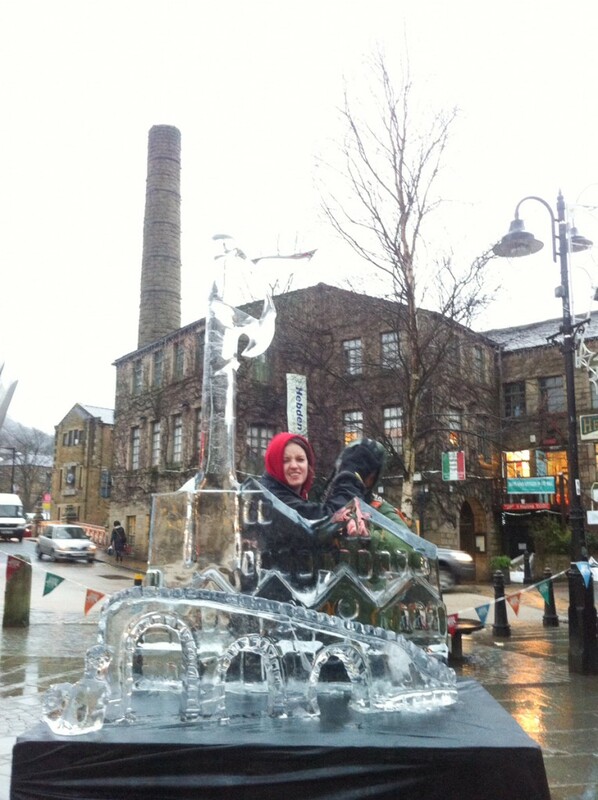 Jamie and I have lived in Hebden Bridge for a few years now. 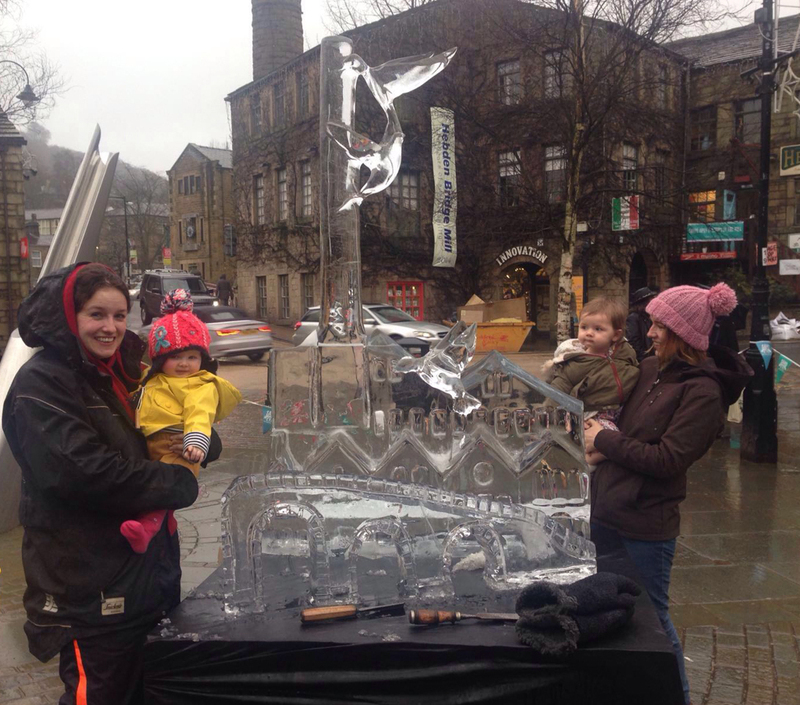 Our little family has grown from just us two, to the addition of our fabulous and feisty Flossy! When the Calder Valley was devastated by floods on Boxing Day last year, it was incredibly sad to see this lovely little village damaged so badly. 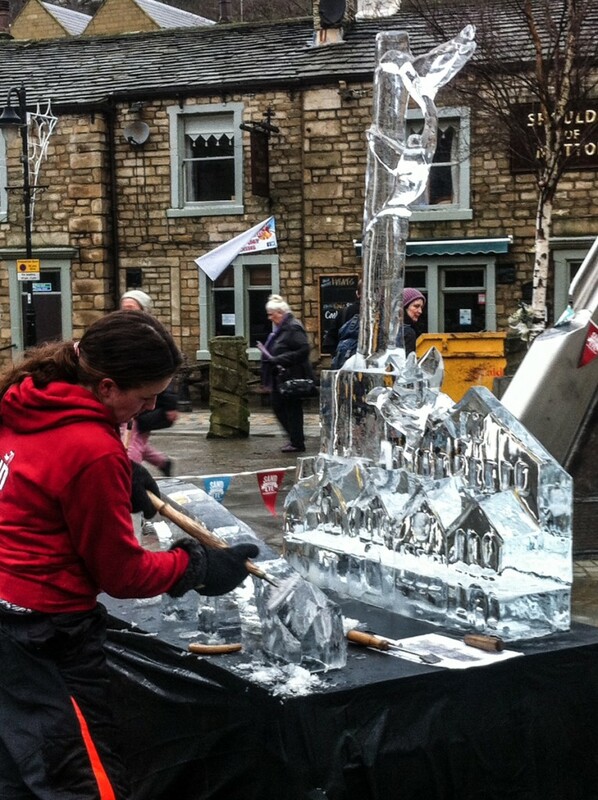 As with many other people, we visited the Town Hall the next morning to see what we could do to help. 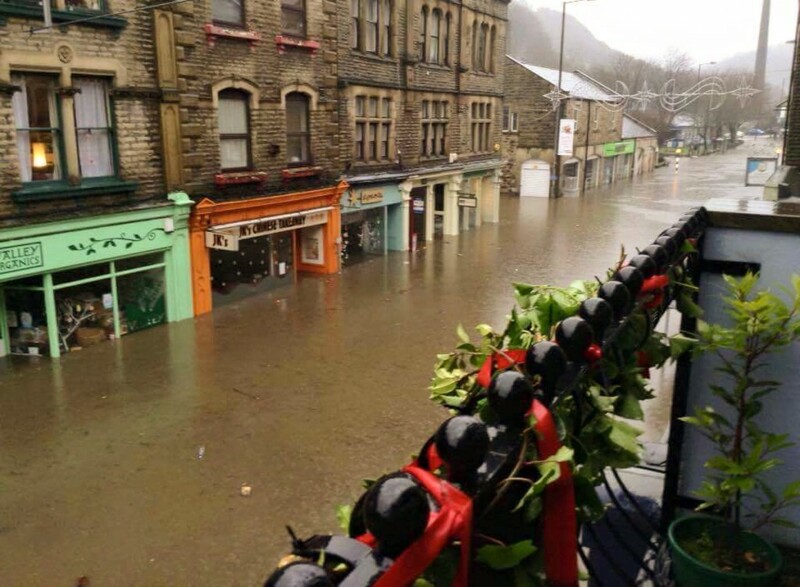 So many people had come out and were straight to work clearing the mud from the streets, emptying damaged furniture and stock from shops and peoples destroyed belongings from their homes. 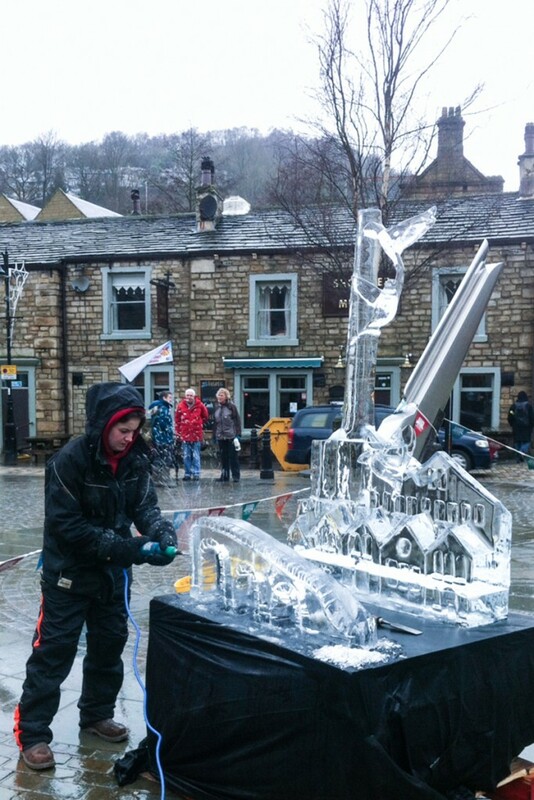 It was quite emotional to witness. 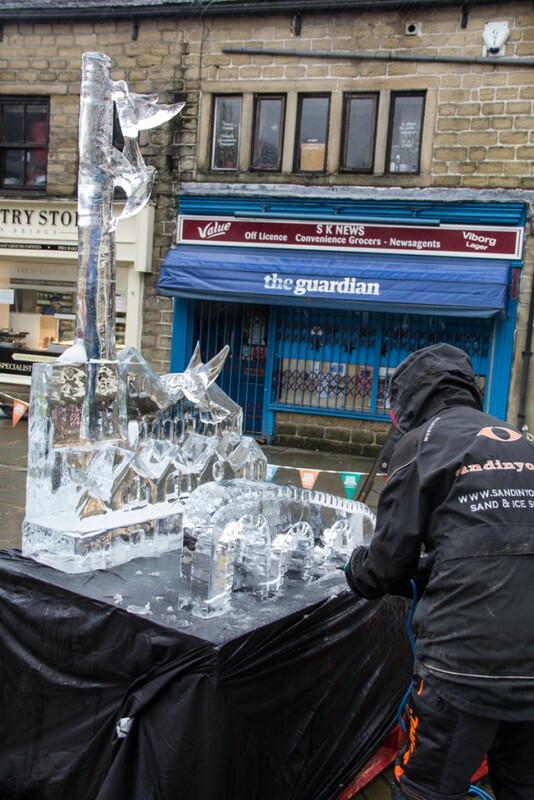 In our van we helped move furniture, damaged items to the tip and deliver sand bags where they were needed. 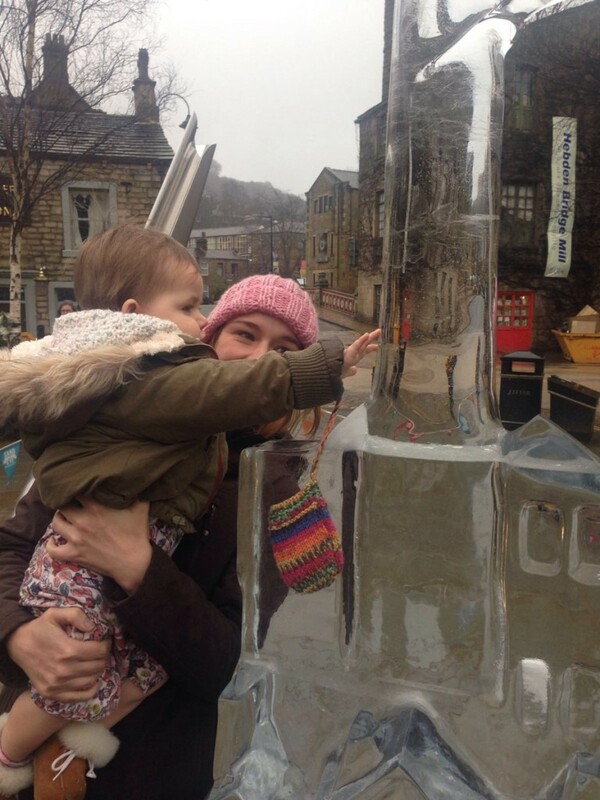 We only had a few days where we could access our fab babysitter, Granny Wardley, so we did what we could in those few days. 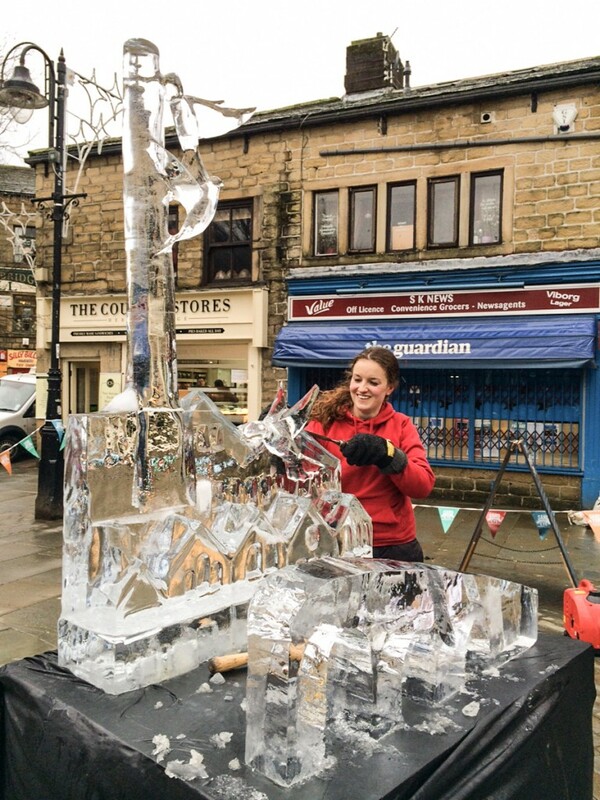 I was overwhelmed as to how many people came to volunteer from all over the country and from all parts of society, just working together doing what they can. 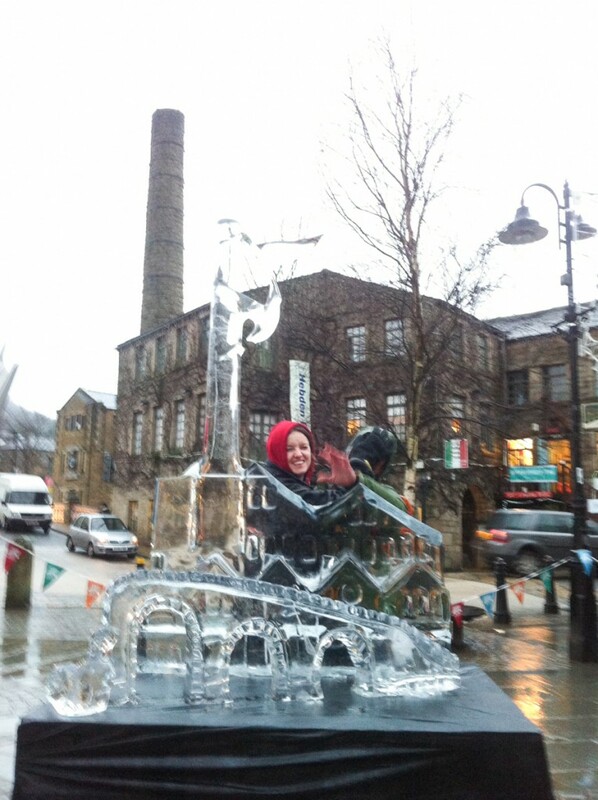 It was just wonderful. We wanted to do something to celebrate all these wonderful volunteers and say a massive thank you. As we were walking in Hebden, Jamie and I walked passed the window of Yorkshire Soap Co. and in the window was this little story. 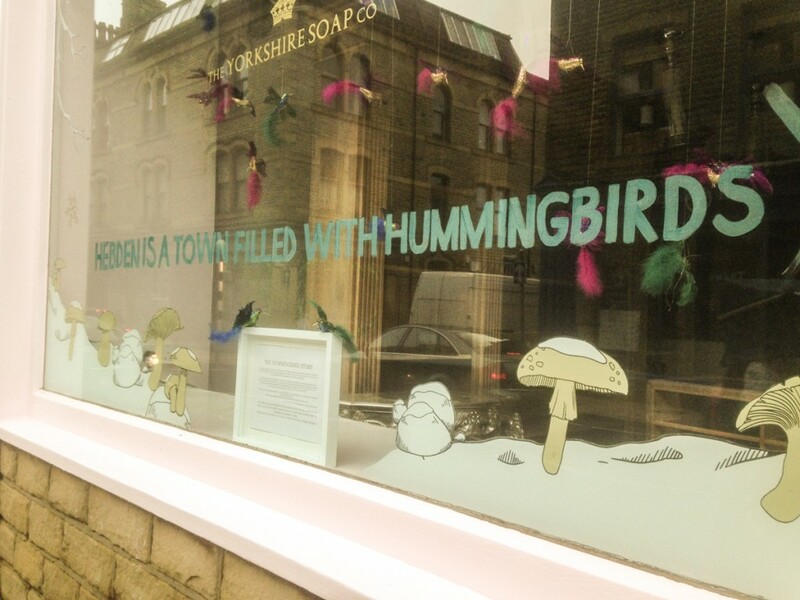 Hummingbird Story in the window of Yorkshire Soap Co. 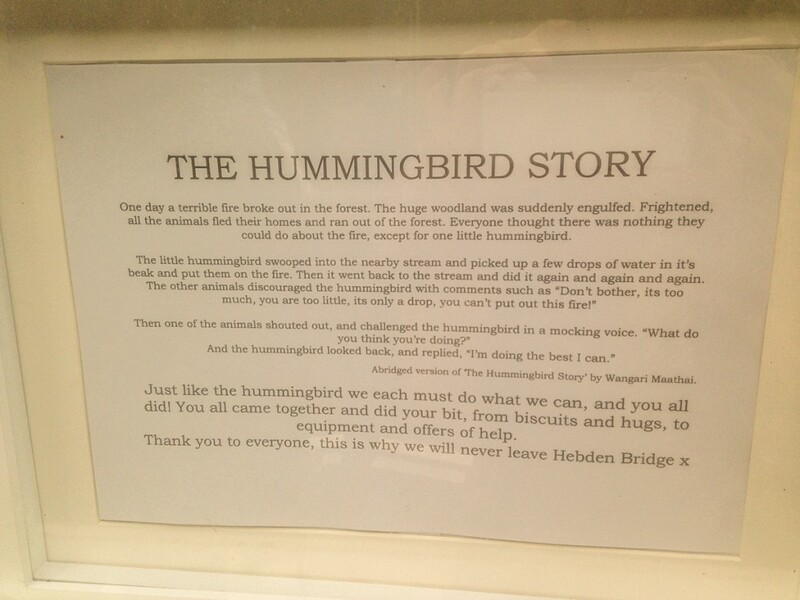 I just loved it, it summed up how I felt about the volunteers. 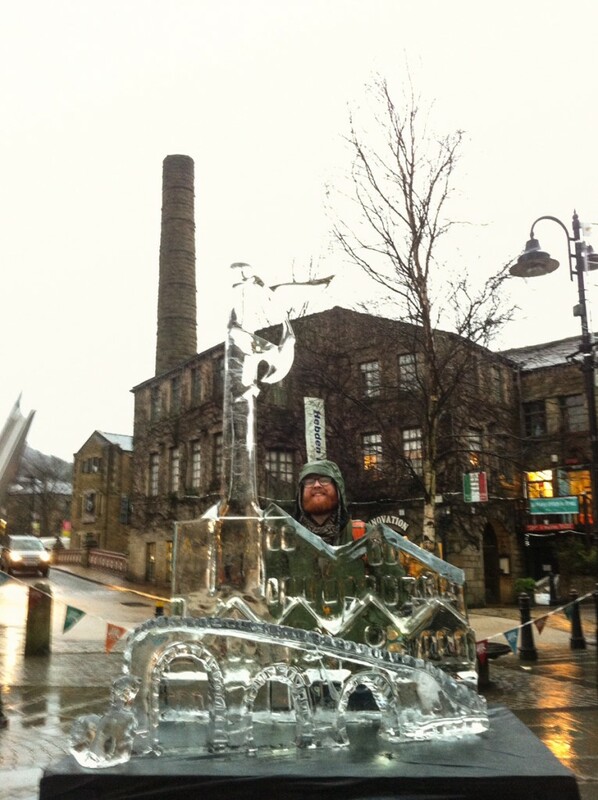 Everyone was doing their bit, no matter how large or small. 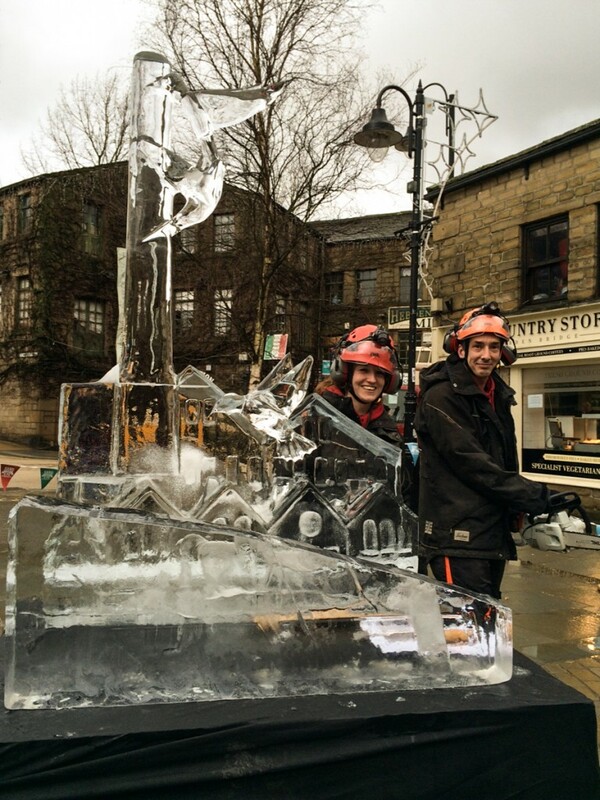 This inspired me to make the Hummingbirds of Hebden Bridge Ice Sculpture. 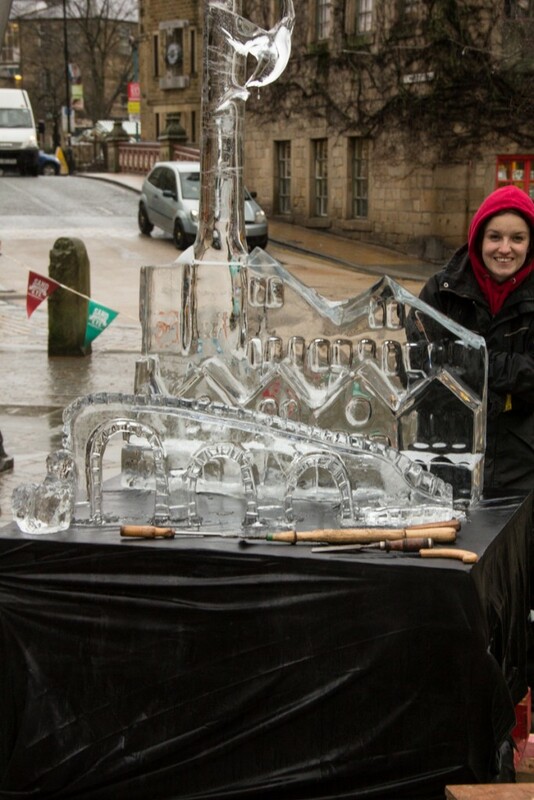 I have worked with Sand In Your Eye for a few years now, but ice sculpture has always eluded me. 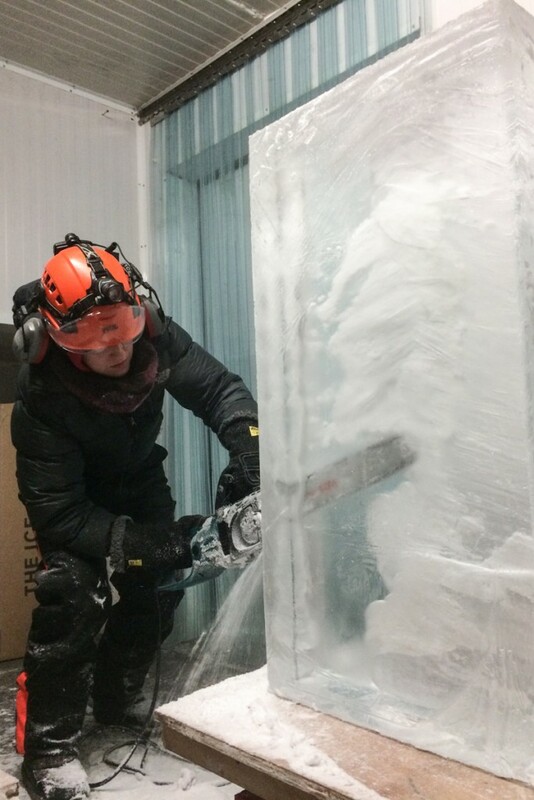 Pregnancy and a newborn baby to look after have been the main reasons, so I had in fact only made one ice sculpture from the beginning before this one and had never carved an ice sculpture live! 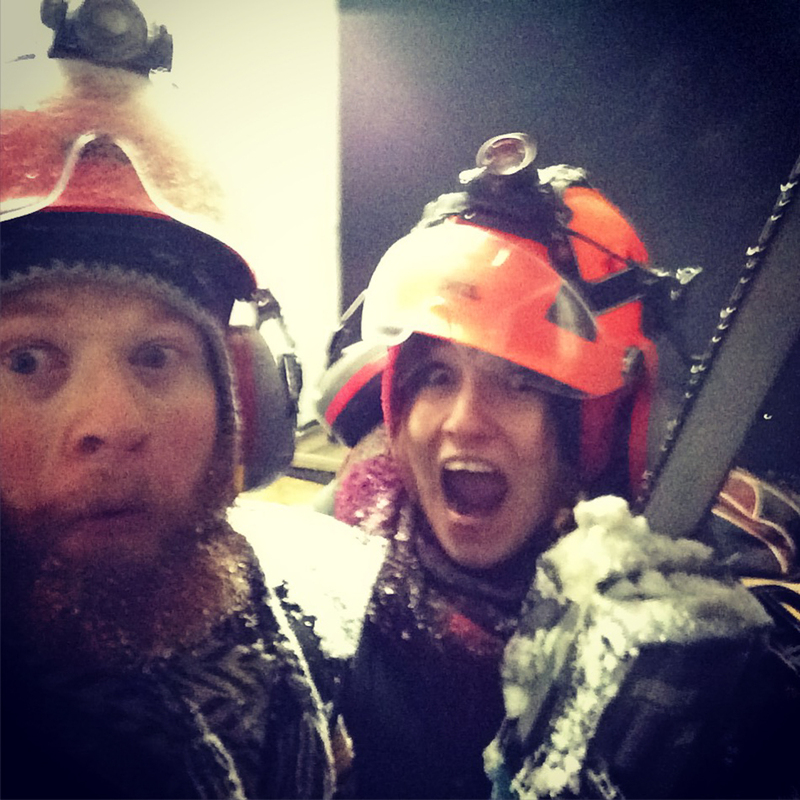 After a little chainsaw refresher from Jamie, I got to work! 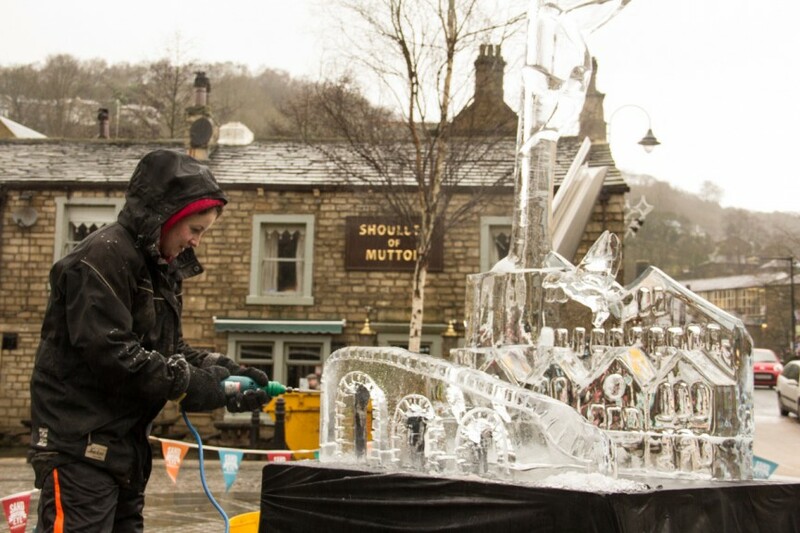 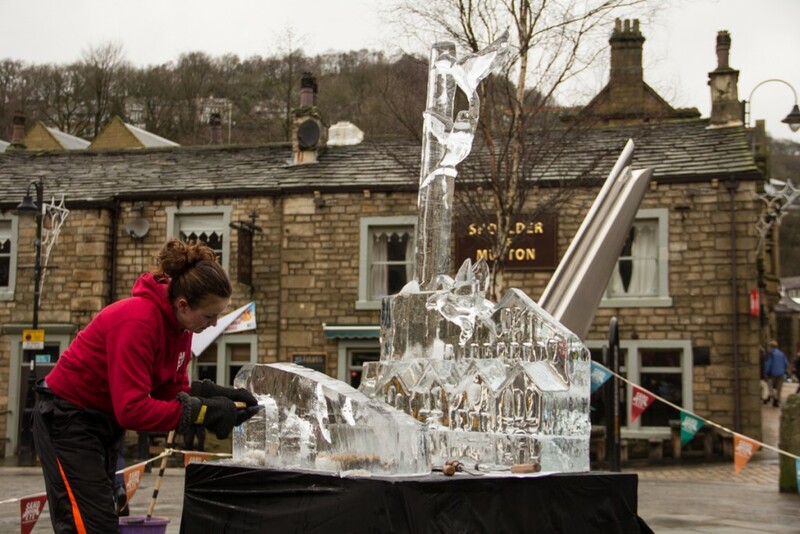 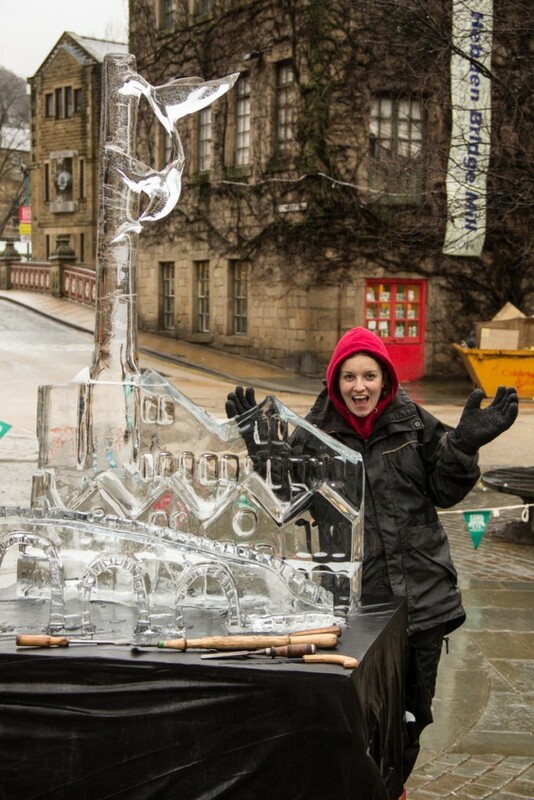 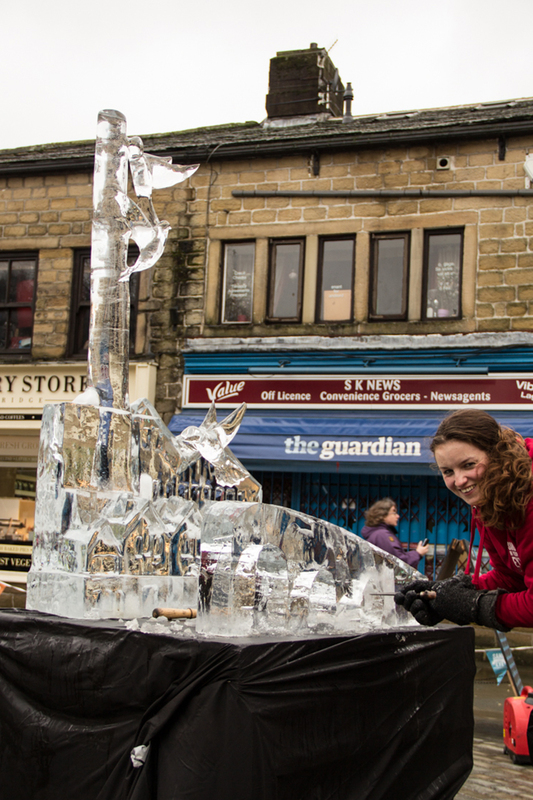 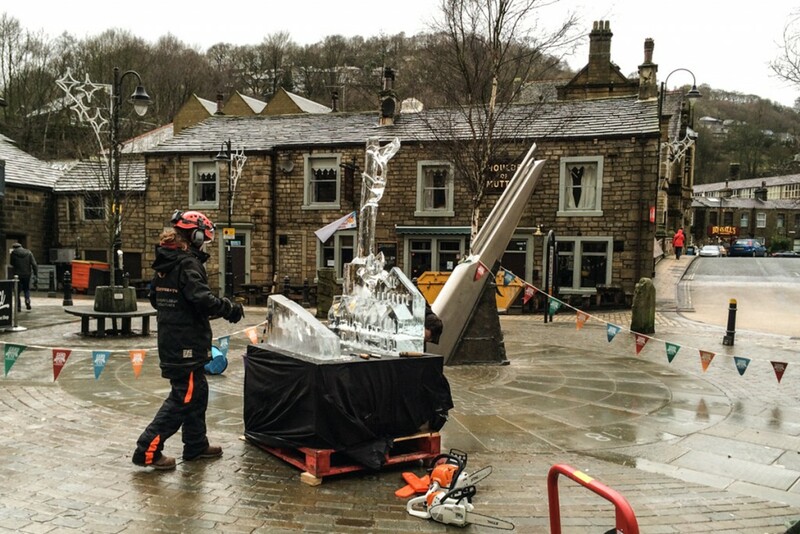 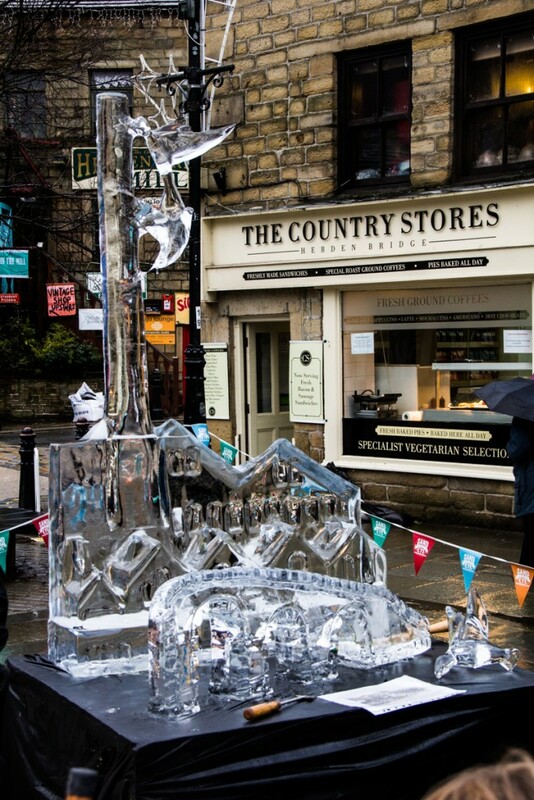 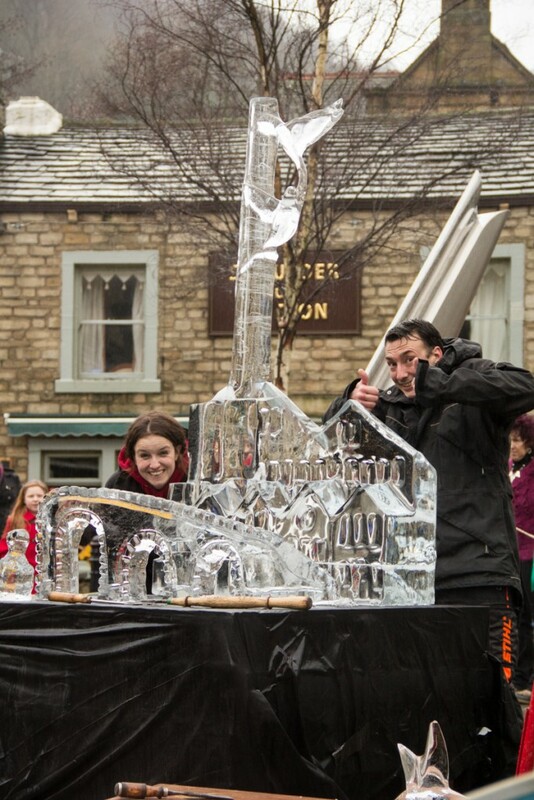 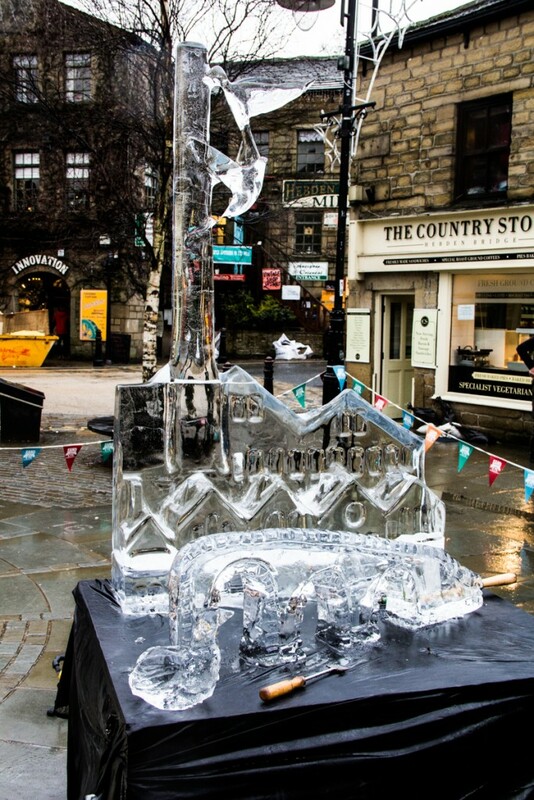 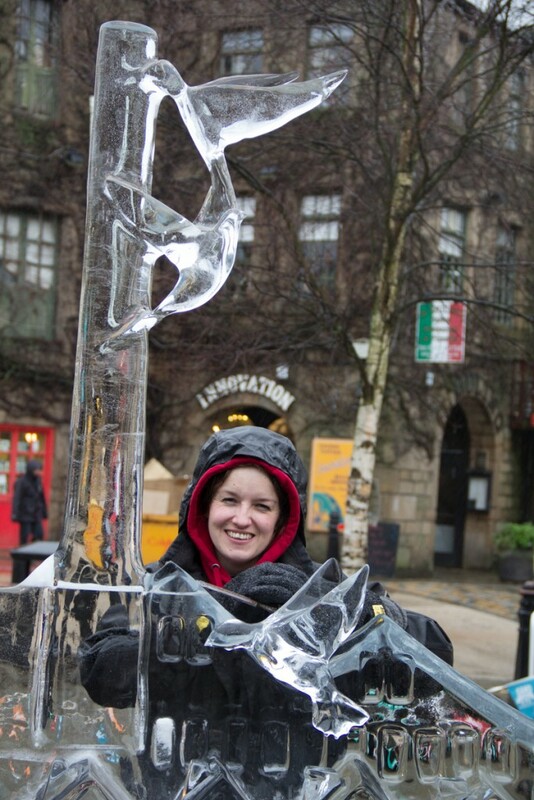 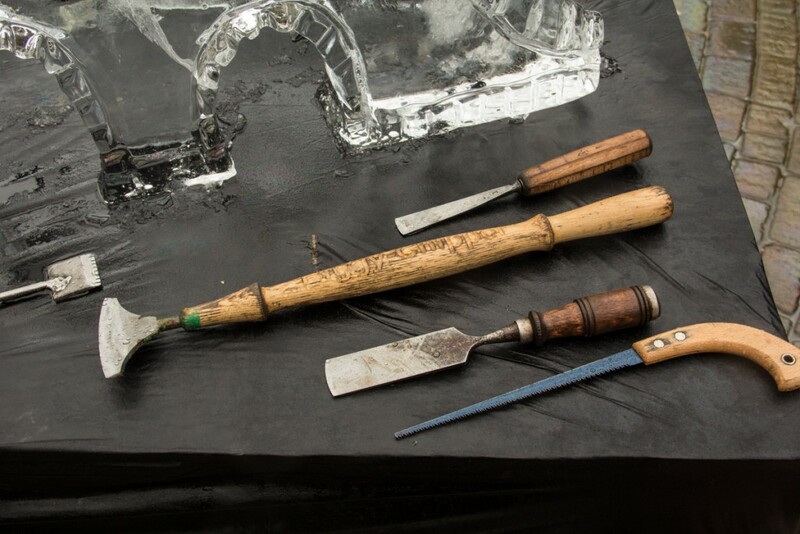 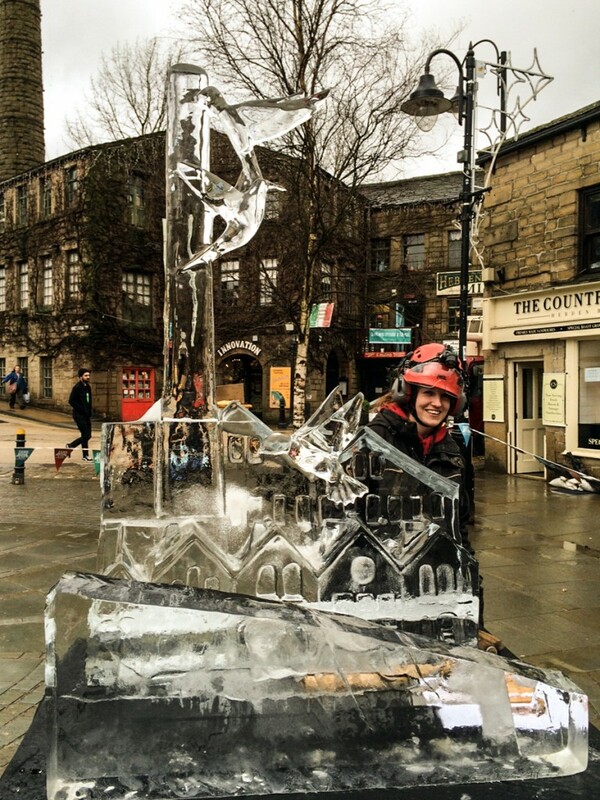 I made a pre carve of the main sculpture in our Bradford ice carving studio and I would then finish it and make a bridge live in Hebden Bridge so the sculpture could be an event to hopefully raise a bit of money for the Calder Valley Flood Fund, but also do something nice for the community. 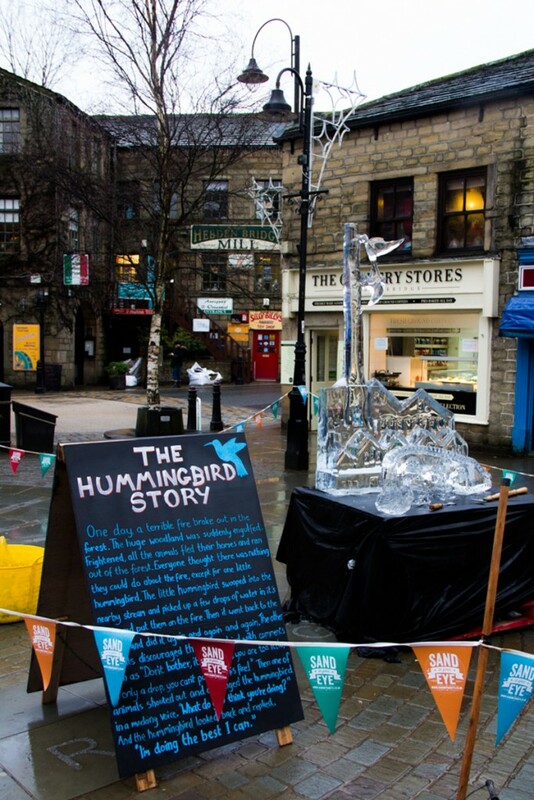 I spent a day and a half in minus 10 and with the addition of an extra hummingbird made by Tom, we were ready to transport the sculpture to Hebden Bridge. 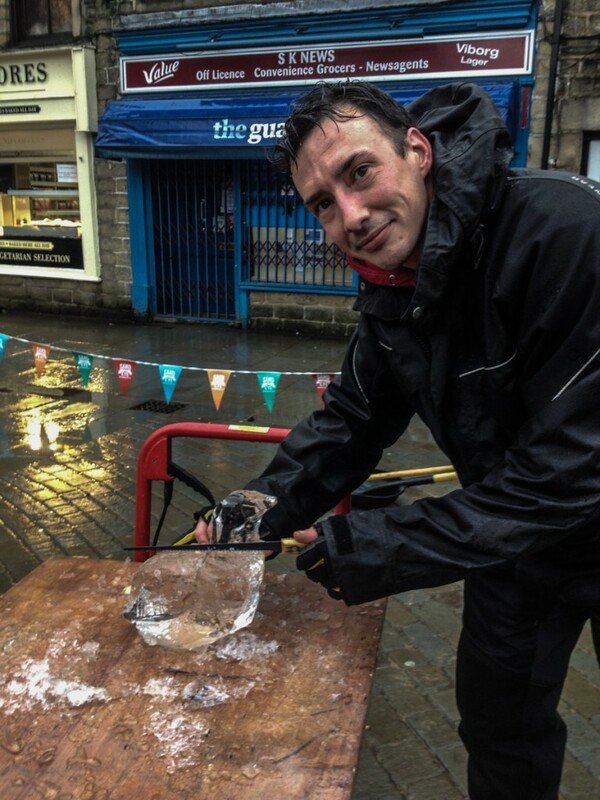 Tom, was a little worried about the weather and we were close to postponing the event, but we didn’t and although we got a little soggy ice sculpting in the rain, I was glad. 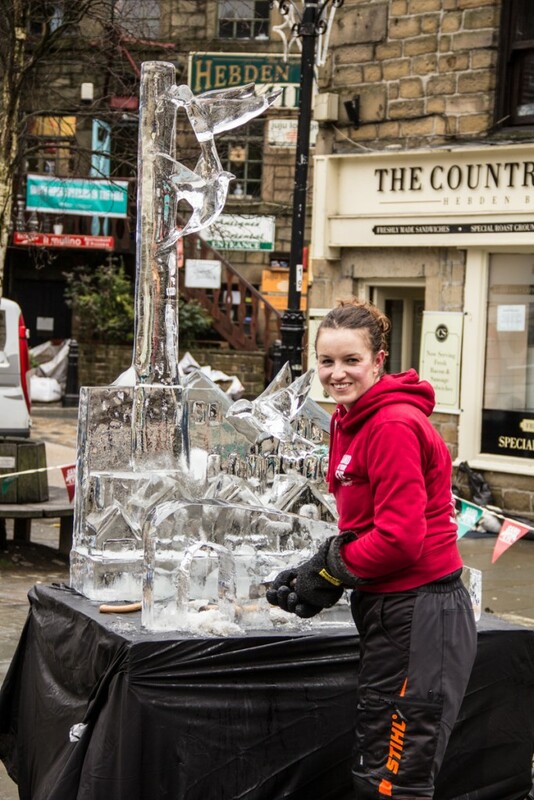 Everyone seemed to really enjoy watching the sculpture develop during the day and we even got a full rendition of Ice, Ice Baby, by Vanilla Ice, including the full rap by a group of school children! 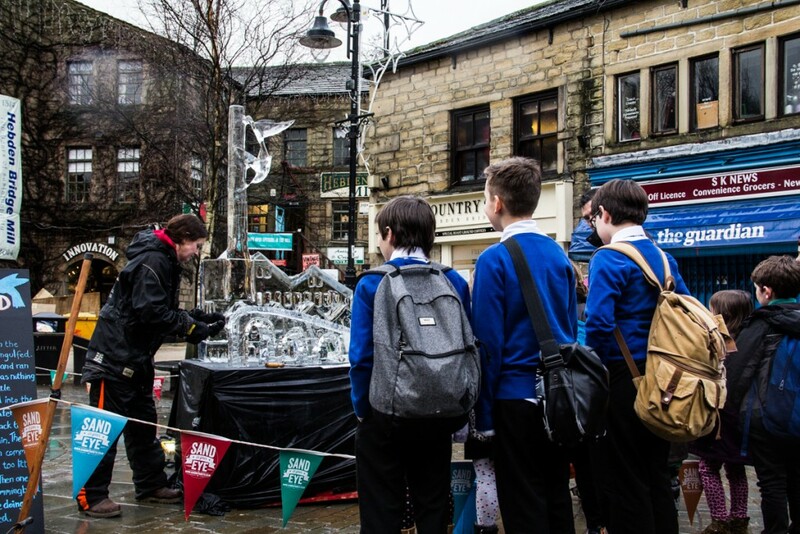 We were really happy that Simon Hulme from the Yorkshire Post popped by and took some photos and we made it on the front page of the paper. 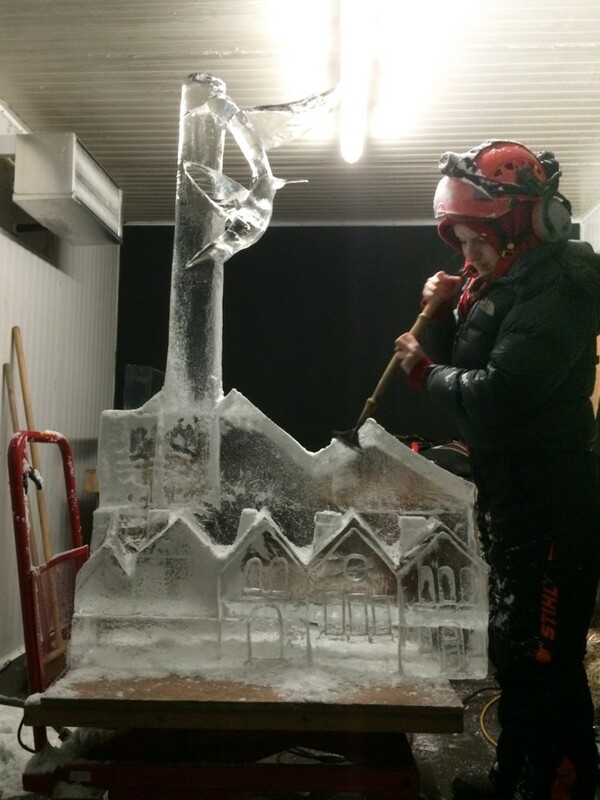 Baby Ice Sculptor in training! 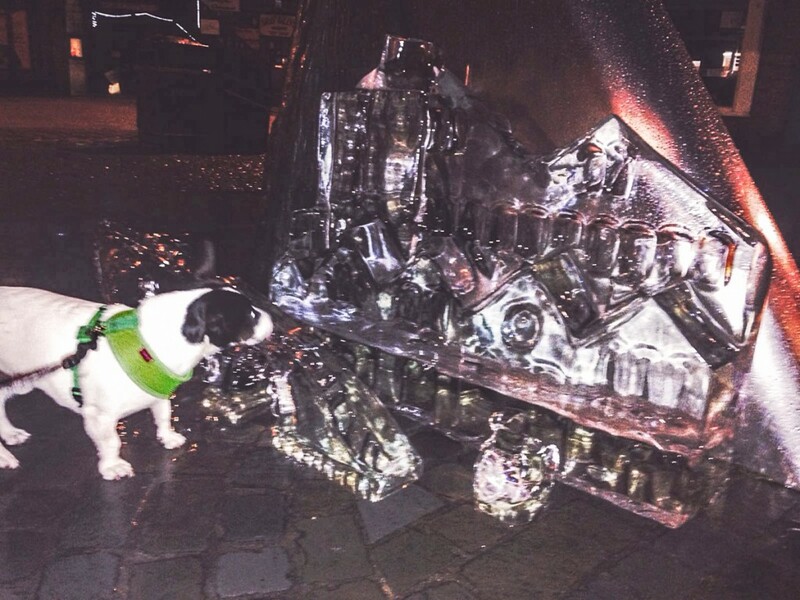 Socks visits the ice sculpture in the evening and gives it his seal of approval!